Past posts have focused on the mechanics of a specific balance sheet, specifically that of the central bank and of private banks. This post looks at the balance-sheet interrelations between the three main macroeconomic sectors of an economy: the domestic private sector, the government sector and the foreign sector. This macro view provides some important insights about issues such as the public debt and deficit, policy goals that are more likely to be achieved, the business cycle, among others. The only financial claims left are those issued to, and issued by, other sectors of the economy than households and banks. Thus, the consolidation process eliminates some important financial interlinkages. This is fine as long as one is merely interested in looking at relationship between sectors, but one should be mindful that this is a simplified picture that hides some important aspects of the economy. The analysis of financial interlinkages among the three main sectors can be done by starting from the National Income and Product Accounts (NIPA), but the derivation from the Financial Accounts of the United States is more intuitive (the derivation from NIPA is done at the end of this post). The following is refresher from post #1. A balance sheet is an accounting document that records what an economic unit owns (assets) and owes (liabilities) (Figure 1). Figure 1. A Basic Balance Sheet. This means that the wealth of any economic sector comes from two sources, net financial wealth (NFW = FA – FL) and real wealth (RA). Each macroeconomic sector has a balance sheet (Figure 2). DP is the domestic private sector, G is the government sector, F is the foreign sector also called the “rest of the world.” The government sector includes all the levels of domestic government (local, state, federal) and the central bank. While the Financial Accounts of the United States include the balance sheet of the central bank in the domestic financial sector—the domestic financial sector includes domestic financial businesses and monetary authority—, it is convenient (for reasons explained in Post 6) to include the central bank in the government sector. The domestic private sector includes domestic households, domestic non-profit organizations, domestic financial businesses, domestic non-financial businesses, and domestic farms. The foreign sector includes anything else (foreign governments, foreign businesses, foreign households, etc.). Note that the adjective “domestic” is always used for the reference country that is studied. “Foreign” includes all other countries. For a domestic economy (government and domestic private sectors are consolidated), there are two sources of wealth: real wealth and net financial wealth on the foreign sector. The public debt is not a source of financial wealth (or poverty) for the domestic economy because it is an asset for the domestic private sector but a debt of the domestic government. The domestic money supply is not a source of financial wealth for the domestic economy because it is an asset of a domestic holder and a liability of a domestic issuer. This last identity is similar to the NIPA identity (S – I) + (T – G) + CABF ≡ 0 (see below for some differences). Given that NW – RA ≡ FA – FL, then (S – I) ≡ Δ(FA – FL). The operations on goods and services are mirrored by financial operations. (S – I) and Δ(FA – FL) are both officially called “net lending”, one measured from the capital account (S – I) and the other measured from the financial accounts Δ(FA – FL). With DPB the domestic private balance, FB the foreign balance (the opposite of the domestic current account balance), GB the government balance, and “balance” being measured either through the capital accounts (net saving) or through the financial accounts (net financial accumulation). No theory, behavioral equations and causalities, was used above to explain the accounting identities (a bit of this is done below to examine the business cycle). The identities simply state that a net injection of funds by a sector must be accumulated in another sector. Every dollar must come from somewhere and must go somewhere. They are many implications but the main one is that one must not study a sector in isolation. Anything that a sector does has an impact other sectors. When a forecast about the budgetary trend of the government is made, the forecaster must recognize the implications for other sectors to see if the forecast is realistic. This is usually not done. For example, the Congressional Budget Office in the early 2000s expected the federal government’s surplus to continue to grow but neglected to look at the implication in terms of the domestic private sector. A continuously rising government surplus implies continuously rising domestic private deficit given the foreign balance, which is not sustainable. Only the federal government of a monetarily sovereign government can sustain permanent deficits. There are many other implications and uses of this framework such as macroeconomic theory (Fullwiler), the madness of fiscal austerity (Rob Parenteau, Fullwiler), among others. 1. The beginning of the economy process requires that someone goes into debt. Let us start with an economy in which nothing has been produced or acquired yet. Say that someone in the economy wants to build a house that costs $10 to build. In order for domestic production to start, workers must be paid, raw material must be purchased (those had to be produced first by the way). House was transferred from firms’ balance sheet to household’s balance sheet. The next period the process would start all over again. This time the firm may have some savings from the previous period to finance part of the production. Spending by the government has allowed the domestic private sector to acquire a financial claim. It is a claim on the government. The foreigner may write a check in a foreign currency (says euros) but when the domestic bank of the housebuilder received the check, it will send the check back to the foreign bank of the buyer and to request a dollar payment. The foreign bank will need to borrow US dollars to settle its debt with the domestic bank. Once the house is sold, the firm makes a $1 profit that is be used to pay interest, dividend and taxes. What is left over is retained earnings, the saving of the firm. Households will also save some funds. But none of that can occur unless someone goes into debt to start production. And for saving to be bigger, debt must increase. 2. Not all sectors can record a surplus at the same time. That is, for the private domestic sector (households and private companies) to be able to record a surplus (NFADP > 0), the government must run a fiscal deficit (NFAG < 0). Put differently, when the government spends, it injects funds in the economy, and when it taxes it withdraws funds from the economy. If the government spends more than what it taxes, there is a net injection of funds by the government in the economy and this net injection must be accumulated somewhere. In the simple case, it is the private domestic sector that must accumulate the funds injected. Of course, the reverse logic applies too. When the private sector deficit spends, it injects a net amount of funds into the economy that can only go to the government. This allows the government to run a surplus. A powerful consequence of this simple accounting rule is that a policy that aims at achieving government surplus implies, in a closed economy, that this policy aims at achieving a domestic private sector deficit. One way to avoid this is to try to achieve a domestic current account surplus, in which case, a country can achieve domestic surpluses across the board—let us call that the “golden” state. The yellow area on Figure 2a shows how small the golden state is relative to all other possibilities. 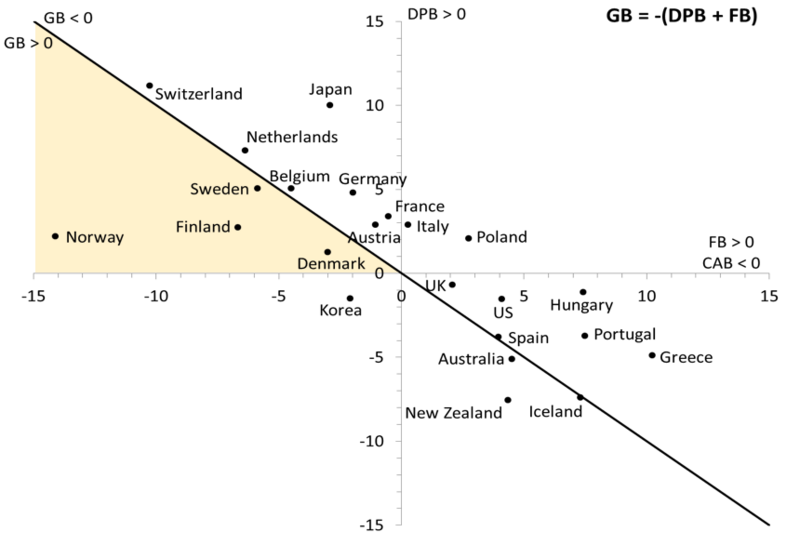 Among OECD countries, it has been achieved mainly by northern European countries (Figures 2a, 2b). This state is difficult to achieve because a domestic current account surplus means that the foreign sector records a current account deficit (FB < 0). Again, not all sectors can be in surplus at the same time, and for every net exporter (and/or net foreign income earners) there must be a net importer (and/or net foreign income payer). Thus, for a domestic economy to achieve the golden state on a regular basis, there must be at least one foreign country that is willing to deficit spend vis-à-vis the domestic economy. This is hardly possible given that countries strive to reach current account surplus most of the time. Ultimately policy makers should confine themselves to try to manage what goes on in their domestic economy. If a country is lucky, developments in the rest of the world may ultimately allow that country to reach the golden state; but basing policy choices on the goal of reaching the golden state is a very long shot. In addition, policies that aim at achieving the golden state limit the ability of domestic sectors to deficit spend, which constrains the ability of the domestic economy to grow. Indeed, the goal becomes to constraint domestic spending by curtailing wage growth, by curtailing government spending and by raising taxes. This keeps costs down (and so keeps the price of exports low to attract foreign buyers) and limits imports (a growing domestic spending usually requires more imports and so makes it difficult to reach a domestic current account surplus). Figure 1. Net financial accumulation of the three major economic sectors in the United States, percent of GDP. Figure 2b. Same with 2005-2010 averages. The public debt is the outstanding U.S. Treasury securities (USTS). It includes both marketable (T-bills, T-notes, T-bonds, TIPSs, and a few others) and non-marketable securities (United States notes, Gold certificates, U.S. savings bonds, Treasury demand deposits issued to States and Local Gov., all sorts of government account series securities held by Deposit Funds). In the early 2000s, the expectation of the day was that fiscal surpluses would continue to go on and rise even more. 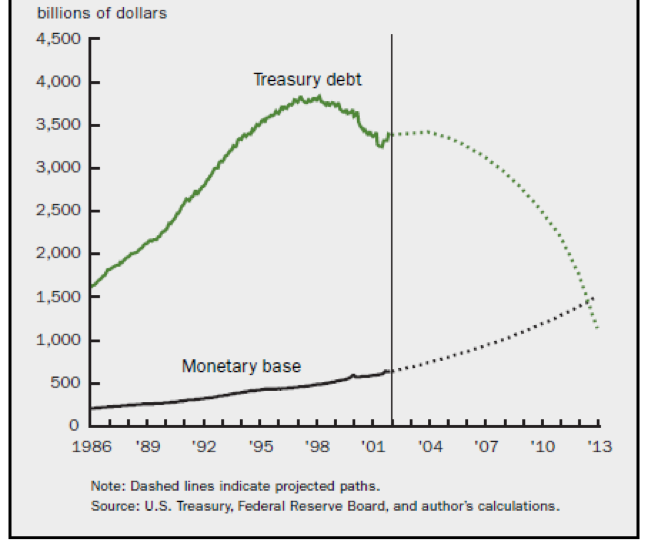 Figure 3 shows the projected path of the public debt and the monetary base. What are the implications of such trend of the public debt? Figure 3 Public debt and monetary base. Now the Treasury wants to eliminate all its financial liabilities: no more public debt! What are the means to do so? Case 1: Let treasuries mature and do not repay holders of treasuries: 100% tax on principal => FADP = 0, the domestic private sector losses all its financial assets. All these cases are detrimental to the domestic private sector because they remove a default-free, liquid, interest earning security from the balance sheet—treasuries. Treasuries are essential, to create wealth in the domestic private sector, to meet capital requirements, to earn interest income in a safe way, and to access to refinancing channels of the central bank. So be careful what you wish for when arguing for repaying the public debt. tends toward a surplus during an expansion because of the automatic stabilizers. Of course it is not actually possible for all of them to be in surplus at the same time, but all of them usually want to be in a surplus at the same time. Step 1: there is a growing economy with NGB = NGBd > 0: Non-government sector net saves what it desires. In that case it must be true that GB < 0, the government is in deficit. Step 2: Government wants to be in surplus (GBd > 0). In a growing economy, automatic stabilizers lower the deficit of the government, which is what the government wants. But, if the government is dissatisfied with the pace of return toward a surplus, it may implement austerity policies that raise taxes (T) and/or lower spending (G) (“the country must live within its means”), which compounds the effect of automatic stabilizers. Thus ∆GB > 0 and so ∆NGB < 0. Step 4: Decline in non-government spending (C, I, X), together with the decline in government spending (G), lead to a decline in aggregate income (GDP = C + I + G + NX). The decline in aggregate income leads to an automatic rise in G and an automatic decline in T, so the government balance falls (∆GB < 0). Income stabilizes. 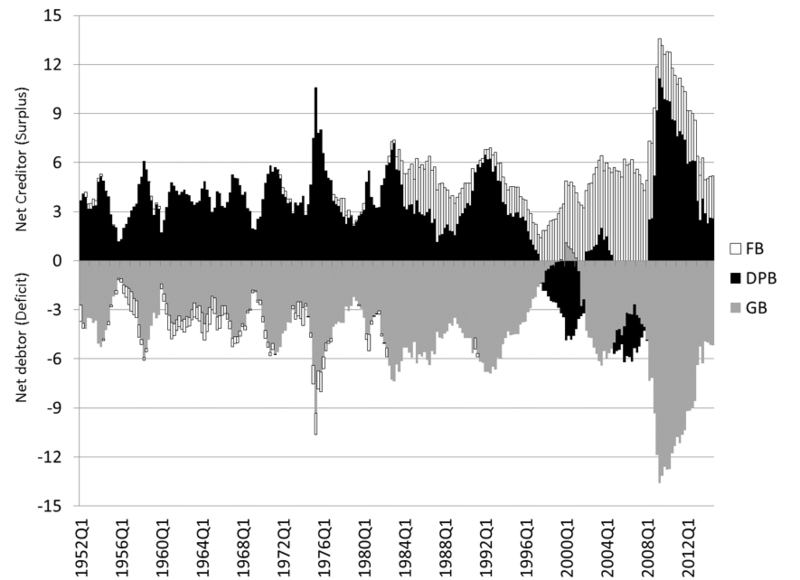 Step 5: the fall in the government balance leads to a rise of the non-government balance (∆NGB > 0) until NGB = NGBd. Back to step 1. Way 1: For GBd to be negative, i.e. 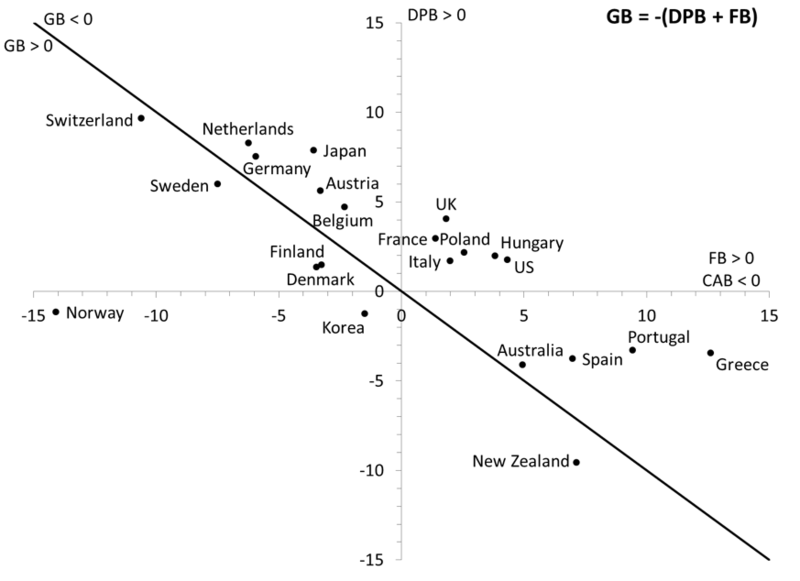 the government is willing to be in deficit, and the deficit equals the equilibrium deficit level (GB*). The equilibrium deficit level is the one compatible with the desired net saving of the non-government sector: GB* = NGBd. This is a viable solution for a monetarily sovereign government, but politicians are reluctant to argue for a permanent fiscal deficit given the lack of understanding of how a monetary sovereign government operates by the general population, politicians and most economists. Bankruptcy, accelerating inflation, and bond vigilantes are usually invoked, although none of them are relevant. DPBd negative: this did happen in the late 1990s and early 2000s in the United States (Figure 1), which made GB > 0 possible. Australia, Korea, New Zealand and some European countries also have recorded a negative domestic private balance (Figure 2a, 2b). However, domestic private sector in deficit is not sustainable because it implies ultimately Ponzi finance (see Post 14). If a country needs to deficit spend vis-a-vis the rest of the world, it means that either the domestic private sector or the government do so, or both. If the domestic private sector does it, it is unstable, if the government does it, it depends on the denomination of the debt (if in domestic currency no problem). For the country supplying the international reserve currency, negative domestic CAB is sustainable only if the currency in unconvertible. If the currency is convertible then the Triffin dilemma holds. The dilemma is that the country must have a deficit of its current account balance in order to supply the currency that the rest of the world needs, but the country faces threats of conversion demands as the supply of reserve currency grows among other countries. A monetarily sovereign federal government usually needs to be in deficit (unless a domestic current account balance can be achieved): such government is always able to service debts denominated in its unit of account. If they have limited economic development and resources. In that case foreign aid instead of private lending is the way to go. If they provide the international currency (United States today). In that case, the rest of the world wants to net save that currency and so the currency-issuing country must record a current account deficit. Given that some countries need to be net importers, others need to be net exporters: there may be a need to clear debt overtime if it accumulates too fast, and to set the interest rate low relative to growth. The current account balance (CAB) is the sum of the trade balance (net exports) and net revenue from abroad (NRA) (net of unilateral current transfers). This last identity is similar to the one obtained from the Financial Accounts except that it is derived from GDP and so is merely concerns with current output (i.e. newly produced goods and services). The National Income and Product Accounts (NIPA) definition of saving is different from that of Financial Accounts (FA) and they are compatible only under specific conditions. NIPA saving is defined as unconsumed income. For example, households saving is defined as disposable income minus spending on consumption goods: S = YD – C. FA saving is defined as the increase in net wealth: S = ΔNW. This difference reflects the different purpose of each account. NIPA is focused on measuring current economic activity with gross domestic product (GDP) at the core of the analysis. So for example, say that an economy produces apples and some of the apples are used to make apple tarts. GDP will be the dollar value of apples left for direct consumption and the dollar value of apple tarts. This is the production for the year. NIPA saving is the value of whatever income was paid less purchases of apple tarts and apples for direct consumption. The dollar value of assets changes overtime because of changes in prices (capital gains/losses) instead of addition to the stock of assets via production or issuance of new securities. Some consumption goods are durable. Liabilities in the balance sheets require principal repayment. The source of difference in this case is that NIPA measures consumption by the amount of spending done for that purpose (buying the apple at the store). Consumption in a balance sheet means that the value of real asset falls (the apples have been eaten). Recently the Bureau of Economic Analysis created the Integrated Macroeconomic Accounts that aim at integrating the two approaches into one single accounting framework. Kenneth Boulding developed an entire framework based on definitions consistent with balance sheet. A clear difference is made between “spending” (using funds to buy the apples: real assets go up and financial assets fall) and “consuming” (eating the apples: real assets depreciate). Developments in economic theory have also aimed at making sure that the accounting of a model is tight. Stock-flow consistency macroeconomic modeling ensures that a model accounts for all the interdependences between the sectors that the model contains. This bit I disagree with. There is more than one ‘international reserve currency’. Foreign states save in a multitude of denominations to sustain their ‘export led policy’. They have no choice but to do that or abandon the policy as the floating rate shifts against their export destinations. I see nothing that justifies the ‘one currency to run them all’ idea. It is a myth. One can disaggregate more if needed indeed. Three will do for some purposes. Each of these 6 sectors has input and output money flows and they mostly have to balance as suggested by the methodology of W.W. Leontief and his matrix method. The stock balances are basically the same thing and consequently there are 6 identity equations for our complete functional system. I’d just like to ask about one point for further clarification. Suppose the household has 100 in income, spends 20 on consumer goods (groceries) and – instead of , say, leaving the remaining 80 in cash or in a bank deposit – spends them on investment goods (for instance, a newly-built apartment). According to the NIPA definition, the household has also “saved” 80 – yet it has in reality spent its whole income of 100 back into the economy, whereas in the other case it has withdrawn a major part of its income from the circular flow of income, by leaving 80 unspent. Thus, when the NIPA registers “saving” it may be describing two very different situations from the point of view of real economic outcomes. The counterpart of saving will always be investment – either a newly-built apartment sold in the market or an increase in the stock (inventory) of unsold apartments – yet the macroeconomic impact coudn’t be more different. Saving is unconsumed income, not just unspent income. I should have been more precise here. Household buying housing is treated as investment expenditure by households (the link on “difference” in the text will give you a lot of details on all this). Any other expenditure by households is considered consumption. So going back to your point, when the household spends $80 on a house, the household is investing, not saving. It took me 5 or 6 tries to get to the site today. An ad came on the screen and it said that the site would return in 8 seconds or whatever, but the site never came on. So I started over and over. I know you have to have money to keep the lights on at the site, but this is a problem here. This is an educational site, if one can get to it. People should be able to. We do not use sponsored advertising. After a recent change in Service Hosting, this issue has appeared sporadically for a few visitors. We are trying to track down the details so that we can eliminate the issue. Sorry for the inconvenience. It seems like Jose’s question still stands. In the “S = Y – C” formulation, investment spending leads to (or ‘comes from’, depending on which way this is viewed) income, while having nothing to do with C. So investment spending increases S just like personal savings, but that is lumping two very different things together. The only way I’ve been able to parse this in the past is that in either case (personal savings as ‘saving’, and investment spending as ‘savings’), you have ‘something to show for’ the income. Whether that is a newly built apartment, or built-up financial savings. Or alternatively, I thought that S=Y-C maybe should be not thought of as ‘unconsumed income’, but rather ‘income that didn’t come from consumption spending’. Basically flipping around between ‘sources’ and ‘uses’ of income. But I’ve never seen any definition which was worded like that. I wonder if anyone else makes sense of it in a better way. I am not sure where the issue is here. Remember that SH + SF = I + DEF + NX so yes investment increases saving (SH is saving of households, SF is saving of firms: derivation is in post 11). Put differently, we also know that NW = RA + NFW so S = I + varNFW. I and S are clearly differentiated, one is an asset side change (I) the other is a net worth change (S). Savings is the accumulated amount of saving.